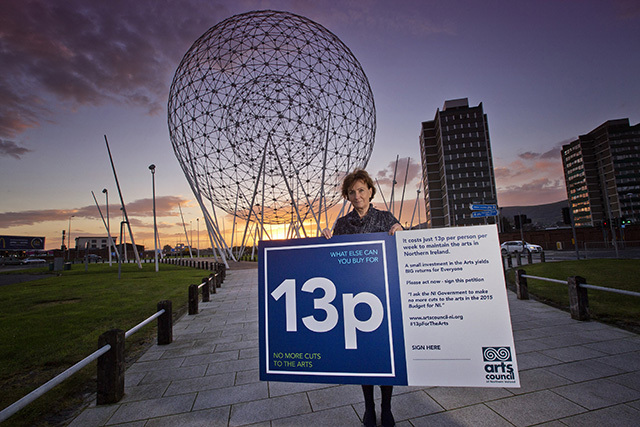 Image: Roisin McDonough has called once again for No More Cuts to the Arts Budget in Northern Ireland. Arts Council of Northern Ireland Chief Executive, Roisin McDonough, speaks out on the proposed cuts to the arts budget. Supporting the campaign for ‘No more cuts to the arts’, actor James Nesbitt observed wryly that “without the arts we’re just left with politics, and we don’t want that”. His tongue may have been planted firmly in his cheek, but that may be the path we’re heading down if the folks on the hill have their way come December 29th. No one is suggesting an Orwellian conspiracy, just an all-too depressingly familiar apathy on the part of our politicians towards arts and creativity. We have to ask ourselves a couple of questions: what value do we place on our arts and creativity, and what does the answer to that question say about us as a society, as a culture and as a people? The Department of Culture, Arts and Leisure (DCAL) is one of the smallest departments, representing only 1% of total government expenditure, yet it is set to sustain one of the largest cuts in the NI Budget 2015-16. The 10% proposed cut to DCAL’s budget equates to a loss of £10m. Within that draft settlement for DCAL, the arts budget has been even further disproportionately reduced by, at best, 11.2%, a loss of almost £1.38m. This proposed cut comes on the back of six successive cuts to the arts since 2011 and would set the arts budget back a decade to below the level last received in 2005-06. To put the current, pre-op arts budget into some kind of perspective, the entire annual arts budget would sustain Health and Social Services for less than one day. Or, if you prefer your sums by rote, it would sustain the education system for less than 2½ days. The justice system would last four days; policing of Twaddell Avenue a year. At just £12.3m, or 0.1% of the total budget for Northern Ireland, public spending on the arts makes a negligible impression on the spending of these departments. Rather than competing, the arts actually support these services, with over half of the work undertaken by the Arts Council’s funded organisations taking place in healthcare and educational environments and with community organisations. The Executive currently invests just 13p per person per week in direct funding for the arts. The comparative figure for Wales is 32p. What can you buy for 13p? Yet this tiny investment yields big returns for Northern Ireland. The arts have become one of Northern Ireland’s main sources of job creation, wealth and competitive strength, feeding the creative industries, which employ 40,000 people and generate annually £714m Gross Value Added to the local economy. That’s bigger than agriculture. They are the backbone of cultural tourism, which is the fastest growing sector within tourism. The 2012 Ulster Bank Belfast Festival at Queen’s, for example, created £577,180 in tourism revenue and benefited local businesses to the tune of £1.95m; and the Tourist Board has calculated that the top five arts events of the Derry~Londonderry City of Culture 2013 generated a 20:1 return on their investment and attracted ⅓ million visitors. In all, the City of Culture boosted tourism to Derry by 50%. What possible sense can it make to cut a sector that helps turn 0.1% of public investment into 4% of GDP? The Derry~Londonderry experience also provides compelling evidence of the power of the arts to transform the profile of a place, in this instance, from city of conflict to city of culture. The arts distinguish us from other places and put us on the map for all the right reasons. They lift our image as a forward-looking, creative place that’s ready to compete and do business; a location of choice for international business and investment. Many would contend that the real worth of the arts lies in social development, in bringing people and communities closer together, promoting cultural pluralism and giving marginalised groups a stronger voice in society. Although this is where the Arts Council directs a great deal of its investment, these are long-term strategies that are neither glamorous nor predicated on short-term economic returns. Making education and outreach basic conditions of grant has helped to democratise the arts and confound one of the laziest truisms trotted out by the naysayers, that the arts are the preserve of a middle class elite. 79% of Arts Council investment goes to the most deprived areas and, perhaps even more tellingly, 70% of people living in these areas now engage with the arts. So the arts enrich everyone’s lives. What possible sense, then, would it make to impose cuts that will force arts organisations to reduce access to the very people and communities the Executive wants to reach out to. James Nesbitt readily acknowledges the role that public funding has played in supporting his career. Without money invested in sustaining a healthy arts community with children’s arts, youth theatre, performance venues, music festivals, carnivals, street festivals, and the like, where will we find the next Liam Neeson, James Galway, Paul Brady, Marie Jones, Barry Douglas, Stephen Rea, Michelle Fairley, Kenneth Branagh, Frances Tomelty, Colin Morgan or Ciaran Hinds? No blockbuster ‘Game of Thrones’, no ‘The Fall’, no ‘The Missing’ no ‘Frankenstein’. No Jamie Dornan. Imagine that if you will. The Arts Council is asking to be dealt nothing more than a fair hand in the 2015 Budget, which means no more cuts to the arts. Find out how to support the campaign for the arts here.